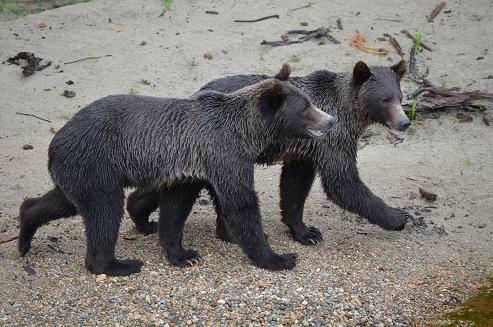 Home > Grizzly Bear and Wildlife Tour Blog > Whale Watching > What is a herring ball? What is a herring ball? Guiding on a whale watching tour is often more about watching for seagulls than for the blows of humpback whales. 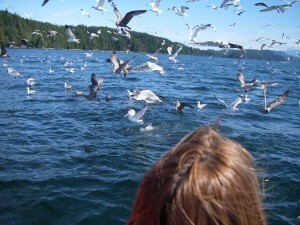 Once whales have been sighted the key is to find the gulls and move toward their feeding area. The gulls are attracted to herring balls. A bait ball, or herring ball, occurs when the herring swarm in a tightly packed formation rotating about a common centre. It is a last-ditch defensive measure adopted when predators such as diving ducks threaten them. The revolving ball moves to the surface and brings the gulls, the guides and in time the humpback whales which lunge from beneath for a mouthful of herring. 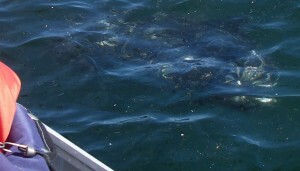 The second photo showing the herring in the water is only obtained with great caution. It is necessary to make sure no whales are in the area before coming close enough for a view of the herring on the surface. It is not good to be this close if whales have been seen anywhere in the preceding half-hour.